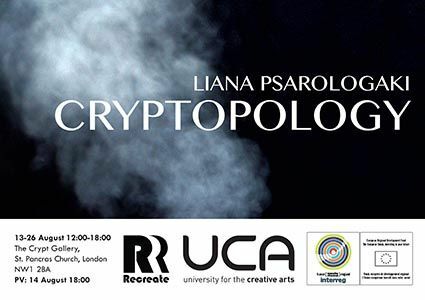 CRYPTOPOLOGY is Liana Psarologaki's first London based solo show. The Crypt of St. Pancras Parish Church is transformed into an omni-sensorial immersive experience inscribed in actual space. The artwork invites the visitors into a maze of sensory engagement with an intention to evoke un-patterned feelings and create intimate experiences. Light, sound, scent, temperature and airflow create different thresholds and enclosures in space. CRYPTOPOLOGY is a project supported by UCA, Re-Create Research & Enterprise Program and The University of Northampton.